Back to haytime. You've already seen this grass being cut on an earlier blog. The cut row of grass is known as a swath (unsure of the spelling but that is how it is pronounced). It is often left to kill on the top but some prefer to get the green grass scattered out as soon as possible to allow it to get air and sun at it. There are mower conditioners used nowadays which beat and crimp the grass as it is cut allowing it to wilt quicker, they will also leave it spread out if required, all aiding to getting a quicker kill. This mower is the older version which basically just cuts the grass. The baler (above) has a pick up wheel on the front which draws the dried grass into a chamber where it is packed into a bale before being tied with string, knotted and spat out the other end. 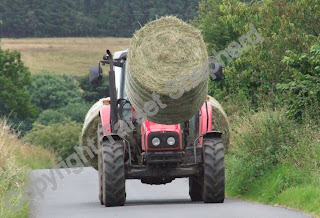 Round bales can also be wrapped with netwrap rather than string before being spat out. The small square baler will have a sledge running behind which holds the bales, once full they are released to lie on the field waiting to be stacked. This actual baler has a flat eight sledge behind, it does just that, leaves the bales in a flat eight which are later lifted with a grab and stacked into a 48 before a bale transporter picks it up and transfers them to the hay shed - gone are the days of hand balling every bale and knocking the knees out of your jeans! The round baler above has just spat it's bale out. A four foot round bale is roughly equivalant to 8 - 10 small bales. Note the baler has backed back sideways across the field to release the bale, you really don't want to meet one of those bales rolling down the field towards you. People have been killed before now. The sky is a bit of a give away on the above photo, the grass was intended for hay, preferably small bales, however, the weather was breaking and the big baler came in. It was very close to being hay but deemed not close enough and to save having dusty, foisty big bales of hay it was later wrapped and ought to come out as good quality haylage. Hay time can be a stressful time of year. I've never enjoyed it and fortunately get away with out being involved these days, the better half is involved though and the stress, mumping and grumping still comes into the house, at least there is someone to let off steam to. When the weather is good and settled it can be a joy but eyes are always skywards, weather forecasts are checked regularily, decisions get made and altered. Silage is indeed a saving grace but you still wish to get that good. Days can be long, cutting grass before the sun is well up to give you the main part of the day to deal with grass that is lying, leading in the evenings and wrapping into the dark of night can all be the norm when the weather is dodgy. Stressful on the mind and body. I often leg pull "what d'y mean you're tired, y've just been sitting on your arse all day!" "How come your neck and shoulders are sore? Is the steering wheel heavy? "(is there any suprise I get mumping and grumping?). Concentration and focus is needed, no time for day dreaming. Spending alot of the time driving forwards but looking back, checking all is well, catching the breakages as soon as they happen before more damage is done. Ensuring everyone's safety. Watching the weather. Eating on the hoof. Maintaining the machinery. One eye open watching out for the unexpected, the other looking for the expected. It's never ending but eventually it will come to an end, a sigh of relief, a count up of bales, an estimate of what will be required throughout the winter, a bigger sigh of relief if the target has been reached. Slight despondency and a quiet prayer for a kind winter if below target. Machinery is eventually repaired, greased, oiled and put away until next time. I say eventually, not immeadiately. The reason being your crop may be secure but your neighbours may well be battling on, should they have any major breakdowns your assistance might well be called for and so the machinery can 'loiter' for a while,on stand-by, just in case! No one wants to see their neighbours stuck.